Considering adding a transportation benefit in 2020? Understanding how to quantify the value of your investment return is critical to evaluating the success of your benefit implementation. Figure 1. A healthy return on investment is one that minimizes costs while simultaneously maximizing benefits. For transportation, benefits are primarily measured by observing metrics around access to transportation, which are directly tied to overall population health outcomes. AS with all social determinants of health, addressing the transportation needs of your member population can directly lead to improved health outcomes and downstream cost savings in the long term. Knowing how to track and evaluate the ROI of a transportation benefit is critical to program success. Understanding the levers to pull toward maximizing ROI enables health plans to optimize for financial efficiency while also ensuring that health outcomes are improved. There are two primary ways to evaluate the ROI of a transportation benefit. The first is to measure leading indicators of population health. Utilization rate - the percentage of eligible members who utilize their transportation benefit at least one time. Engagement rate - the percentage of allotted rides that a given member uses as part of their benefit package. Appointment on-time rate - the percentage of rides to medical appointments that were completed on time (i.e. ; before the appointment start time). Ride cancellation rate - the percentage of scheduled rides that were cancelled or otherwise not completed. In sum, if more members are getting to more appointments more reliably, the member population will see long-term improved outcomes. Figure 2. One SafeRide partner improved their appointment on-time rate by five percent. The SafeRide technology platform tracks each of the above metrics at a unit-ride and member level, allowing our partners to closely analyze the impacts of their transportation programs on care access. One SafeRide partner, a national provider of dialysis and other ESRD-related care services, saw their appointment on-time rate increase from around 85% to over 90% in their first year of implementing a transportation benefit (Figure 2). For a hypothetical population of 50,000 members utilizing four trips to care annually, such an increase would yield 10,000 additional care appointments accessed on time per year across an organization. Over the same time period, this partner also experienced a nearly 30% decrease in the rate of cancelled rides (and subsequently, cancelled appointments). Their decision to work with SafeRide to implement a transportation benefit has directly led to increased care access for their members, which indicates a healthier population in the long run. Understanding the financial value of a transportation benefit is the second way by which ROI can be measured. Generally, financial ROI can be measured both by the cost optimization of the transportation program itself as well as the downstream cost savings from increasing access to care services. Figure 3. SafeRide has enabled a multi-facility provider network to decrease their transportation costs by over $5 per ride. The best way to measure the cost optimization of a transportation program is to observe the unit costs of supplying rides to members. An effective transportation program is one that adequately service the transportation needs of the member population at the lowest unit cost. In SafeRide’s work with a multi-facility provider network in the Pacific Northwest, our comprehensive transportation network sourcing strategy has enabled them to decrease their per-ride costs by 13.5% in nine months, representing a $5 savings on each ride provided to their members (Figure 3). This was achieved without sacrificing quality or volume; their monthly ride volume has nearly tripled during the same time period. By focusing on providing a great member experience while simultaneously optimizing unit costs, our partner was able to achieve a quantifiable financial return on their program investment. 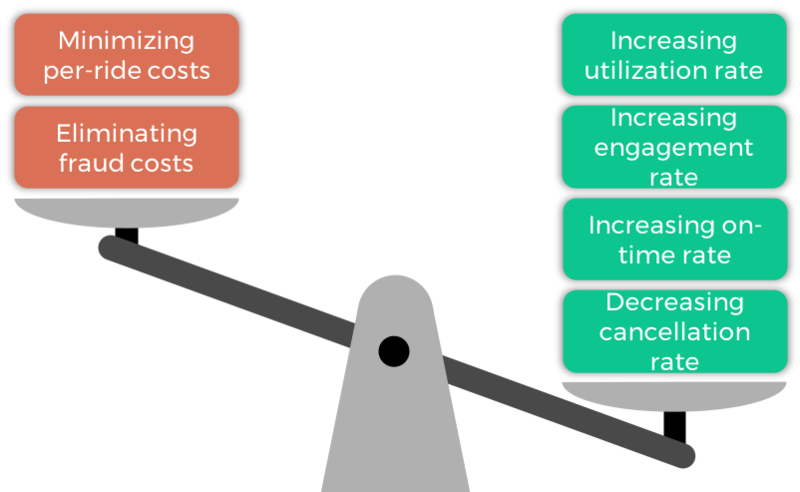 Cost optimization can additionally be quantified by measuring the avoidance of unnecessary costs. In the case of transportation, costs incurred from fraud, waste, and abuse (FWA) can oftentimes be quite significant. SafeRide not only flags rides that are potentially fraudulent based on multiple predictive analytics, but also proactively works with each transportation vendor to ensure that partners do not bear the burden of those costs. Over the same nine month time period with our partner in the Pacific Northwest, SafeRide flagged hundreds of potentially fraudulent rides, resulting in over $2,000 in cost avoidance that they would have otherwise paid had they not been able to adequately address FWA. Figure 4. For every $1 invested in transportation, the state of Florida saw a financial payback of $11.08. While cost savings are more difficult to measure, there are encouraging signs that transportation represents an outstanding ROI opportunity. A foundational 2008 study based in Florida - “Florida Transportation Disadvantaged Programs: Return On Investment Study” - found that if just 1% of medical transportation trips led to a hospital stay avoidance, the state would see a 1,108% financial ROI (Figure 4). If a transportation program can result in an ROI that’s even a small fraction of this, it is a worthwhile (and arguably financially imperative) investment for a health plan to make. At SafeRide Health, our technology suite provides transparent data around transportation program performance, empowering health plans to analyze and optimize the ROI of implementing a benefit. Contact us today to learn more about how we can help you achieve tangible success for your members and for your bottom line. The dos and don'ts of managing a transportation benefit.